This Jewish Faith-Based tour of L.A is great for any group interested in culture, history, and L.A-centric facts! Walking Tour of Boyle Heights - Start out your 4-day Jewish Culture tour of L.A with a walking tour of Boyle Heights, an iconically cultural neighborhood that hosts heavy histories of both Jewish and Latino communities. If there is not any sort of annual community tour happening during your visit, just download a virtual tour from John Arroyo with CicLAvia tours and see it all on your own. See the green lush space of Hollenbeck Park before you head deep into the diverse immigrant history of the actual BH community. Explore progressive community centers, original Jewish Delis (canter’s) and even important cultural landmarks for the Jewish community such as Max Factor’s home and the Jewish Home for the Aged (Keiro). A quick look at this community will show you what life was like for these immigrants back in the 1920’s and 30’s, when 40% of this community was made of Jewish secular working class members, mostly Eastern European, speaking Yiddish, enjoying a life of multiculturalism and ‘leftist political activism’. Broad Street Shul - Broad Street Shul is one of the most iconic architectural and cultural members of the Boyle Heights community, this ‘Queen of the Shuls’ once considered to be the largest congregation west of Chicago. Built in the manner of a Eastern European synagogue, this religious and cultural anchor of the east sides of this Jewish community held 75,000 members at it’s peak, a major landmark in this area, considerably. This is the most monumental orthodox creation of it’s kind, enjoying a heavy popularity from the 20’s to the 50’s. The architecture was designed by Abram Edelman, whose father himself was the first rabbi in LA. Enjoy the various features of this Byzantine Revival building, with its round arches, bas-relief ornamentalism, and dichromatic brickwork. The inside walls are plastered with Eastern European folk art that gives the entire place a sort of old-world sensibility, the entire establishment a great sign of ‘civic, social, and philanthropic’ successes. Dinner at Grimaldi’s LA - We know you’re going to be hungry after the trip, so we think this is a great time to stop at Grimaldi’s, the Brooklyn classic that is delighting taste buds all the way on the West Coast! A visit to Grimaldi's is like getting the taste of two major cities in one trip, the delicious coal-fired brick oven pies with over 100 years of Brooklyn experience giving you a bite of New York, and the always-fresh ingredients, handmade mozzarella, and house-made sauce and dough giving you a new crisp taste of California.You can find these crisp crusts and perfectly baked calzones on El Segundo here in L.A, the eatery working well with larger groups looking for a late night snack. Try the Brooklyn Bridge or Don Pizza, or perhaps just make your very own, with toppings to choose from such as artichoke hearts and anchovies, bacon or sun-dried tomatoes. Los Angeles Museum of the Holocaust - Start your morning out in LA by paying homage to a serious cultural iconic in the region, the Los Angeles Museum of the Holocaust. This strikingly bold and beautiful building is located within the Pan Pacific Park of the Fairfax District, first built here in 1961. Considered to be the oldest of its kind, this museum focuses on the ‘remembrance and presentation of the history, stories, victims, and tragic events of the Holocaust during World War II’. Free to any visitor, this is one of the most affordable and most moving things you can do while in L.A, both culturally and historically. This is your opportunity to see an actual preserved collection of real Holocaust artifacts from those who survived the horror themselves, the perfect opportunity for both education and remembrance.Tours around the museum are free, highly popular options for school or church groups with 12-140 members in them. Hollywood Walk of Fame - Get ready to say hello to the stars as you and your group explore the iconic Hollywood Walk of Fame. This 15-block sidewalk stretch holds more than 2,500 five-pointed terrazzo and brass stars, each one embedded into the concrete of Hollywood Boulevard, plus three blocks of Vine Street in Hollywood. This legendary memorial walkway bears the biggest names in the entertainment industry and is internationally recognized as a classic Hollywood icon. The Hollywood Walk of Fame is undoubtedly a top visitor attraction for L.A, the state of California, bringing in hordes of curious travelers and guests daily. Not only that, but this walkway is also considered to be ‘one of the most successful marketing ideas ever produced’, a legend beginning with E.M Stuart in 1953 and still continuing to go strong today! Be sure to wear comfortable walking shoes if you want to explore it all, or you can just find your favorite star and snap a picture with it! TCL Chinese Theater Tour - If you’ve ever seen movies set in Hollywood or know anything about Tinseltown’s popular attractions, chances are you will recognize Grauman’s Chinese Theatre for its iconic red Chinese pagoda facade. This major tourist destination is still the most famous theatre in the world and has hosted more movie premieres than any other in its 70 year history. Explore the Asian statuettes, gongs, urns, shields, icons and other decor spread throughout the theatre while here, or even see a movie! The theatre now offers twenty minute walking tours highlighting the theatre’s history with behind-the-scenes information. Tours include a look at the unique costume collection which includes Marilyn Monroe’s gold dress from Gentlemen Prefer Blondes and more. You are also allowed to take pictures of the theatre’s interior on the tour while general visitors are not permitted. If your group enjoys movies or pop culture, Grauman’s Chinese Theatre is the perfect destination to get both history and entertainment. Museum of Tolerance - Spend your morning exploring the L.A Museum of Tolerance, the Simon Wiesenthal Center Museum located on Pico Boulevard that provides a multimedia education experience you won’t get anywhere else. Founded in 1993, this museum takes guests on average 2.5 hours to see it all, the museum dedicated to ‘examining racism and prejudices around the world’, with a strong focus on the history of the Holocaust. You will be able to take a journey through the dramatic and dark history of the 20th century, with countless films and educational exhibits inside. Guests will even walk away with new ways to fight modern-day discrimination around the world. The thrilling exhibits you will see inside will be organized into 4 different main exhibition areas: The Holocaust, Tolerancenter, Anne, and Finding Families, Finding Ourselves. There will also be various events or daily programs happening during your trip, not to mention the countless options for group tours and field trip programs. 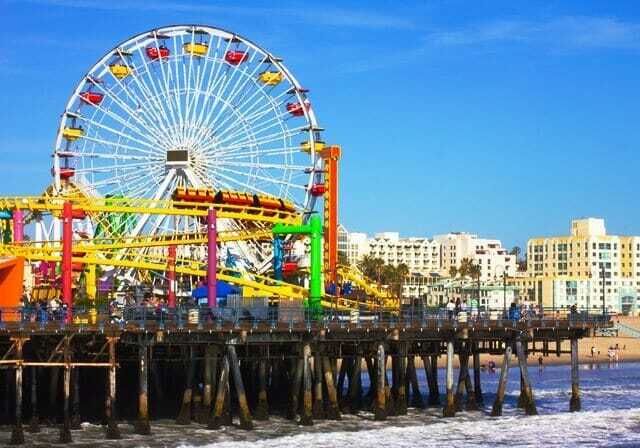 Santa Monica Pier - We think you are really going to love your stop at the famous Santa Monica Pier, the truly iconic Los Angeles classic beach-side attraction. The sheer history of this city structure is really amazing, tracing back to a decision made in 1909 to create a city sewage pipe underneath a 1,600 foot long concrete pier (though it was never finished). While here your group can head to the Pier Shop at the bottom of the ramp to get some essential visitors information, pier history, and official apparel, or perhaps go blow off some steam at the amusement park. If you are ready for a rest just use this time to walk over the waves and admire the California coastal scenery, or perhaps opt in for a nice sit down meal at any of the eight different diverse and delicious eateries onsite, such as Rusty’s Surf Ranch or Pier Burgers. Skirball Cultural Center - Welcome to the Skirball Cultural Center, the L.A educational institution dedicated to ‘sustaining Jewish heritage and American democratic ideals’. Established here in 1996, Skirball is a well-known contemporary facility that is filled with historic exhibits, various courses, and special lectures/readings. School groups especially love this facility, with daily tours from experienced educators and docents. Enjoy regular family festivals, cultural history programs, and even two onsite museum stores (Audrey’s Museum Store and Noah’s Ark Store) and eateries (Zeidler’s Cafe and Zeidler’s Cart). The best part, however, may be Noah’s Ark. Noah’s Ark is a ‘celebration of play, inspiring fascination, reviving wonder’ (New York Times), a children’s exhibition larger than life! This permanent, award-winning floor to ceiling addition to the museum holds around 400 life-size animal constructions, many of them interactive machines. There is even a 16 foot giraffe inside! Grove and Farmers Market -The Grove and the L.A Farmer’s Market are two really amazing attractions that are amazingly close to each other, making it an easily doable must-stop to add to your list. This quintessential LA experience allows you to enjoy great dining, entertainment, and shopping at the Grove, as well as a gorgeous and history-filled stroll through the melting pot of cultures and cuisines within the adjacent Farmer’s Market, allowing you and your group to experience the best of both worlds, so to speak. The Grove is essentially a modern plaza-style mega-mall, and the Farmer’s Market has been a local hot spot for fresh produce and people watching for more than 80 years here in Hollywood. It is actually known to be the home of LA’s first pizza, finest meats and seafood, freshest produce, best chocolates, and most delicious handmade ice cream! Your stomach and sense of adventure will definitely thank us for this one!